The fight to retain Southall Town Hall is to go to a full judicial review hearing. Campaigners seeking to preserve the Town Hall as a hub for the community had been disappointed when a judge decided that their case should not proceed. However at an 18th April hearing at the Royal Courts of Justice, Judge Kate Markus QC ruled the case should go to a full hearing. 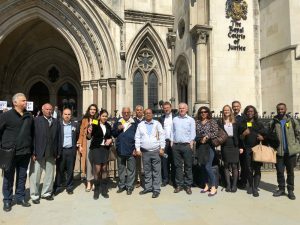 A large number of campaign members and supporters demonstrated how important this issue is for the Southall community by attending the hearing. Regular Save Southall Town Hall meetings take place every Monday 6.30 pm in, er, Southall Town Hall. Everyone is assured of a welcome. ← Ealing Town Hall. Do we have any alternatives?